Everyone had a good day but Joe and Rosie won the 'stall of the day' competition! 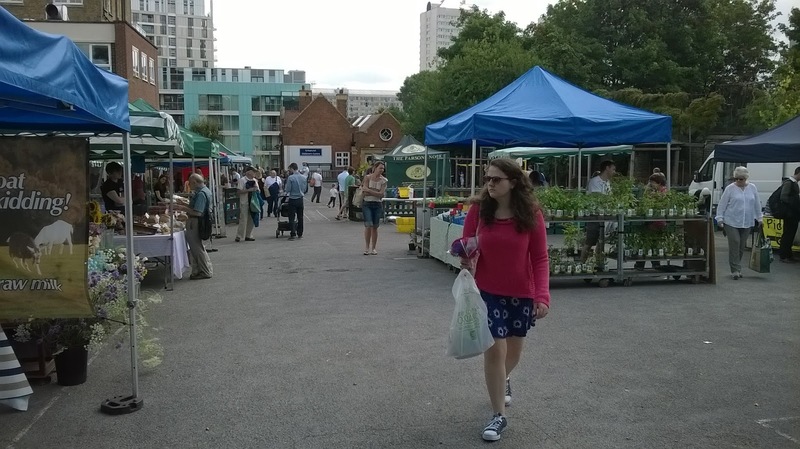 We have a little friendly rivalry between us all to see who can sell the most on one day at market. 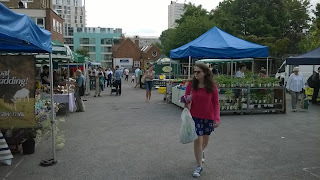 Borough should win hands down but they only beat me by £5 yesterday thanks to the lovely people of Ealing. 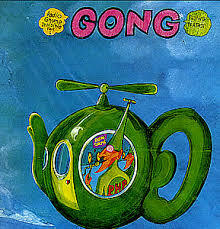 Incidentally, an interesting conversation with a customer at Ealing yesterday revealed that he had been a roadie for the hippy group Gong in the 1970's. Now, everyone I have spoken to since yesterday has no clue who Gong were ... but I remember them well and they were one of my favourite bands at the time. 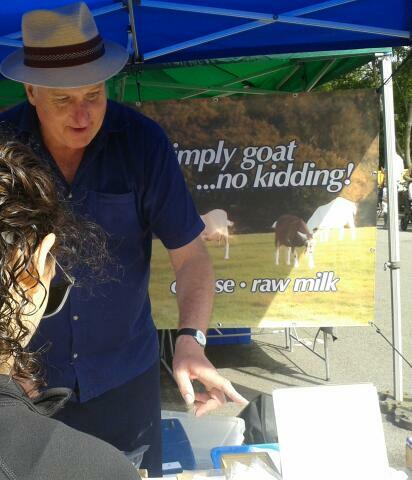 It has to be said that they were extremely 'progressive' but the conversation with this gentleman brought back fond memories and I think that he was very surprised to find some batty old goatkeeper at a farmers market had actually heard of them! 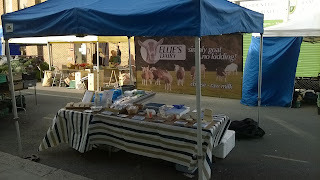 Today was a day of rest for everyone apart from your truly who was off again, bright and early, to West Hill Farmers Market. This is just a temporary spot for us whilst Parson's Green is closed for building works over the summer hols. 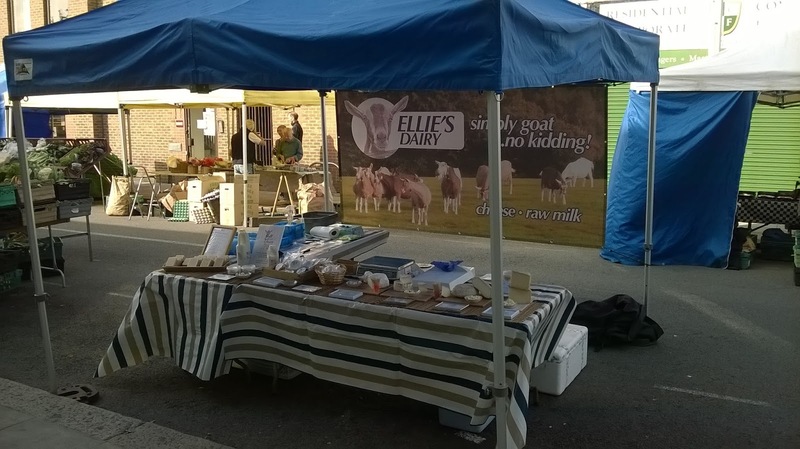 And today I was absolutely thrilled to meet Pete the Cheese from White Lake Dairy who was also at the market selling his wonderful goat's cheese. This man is one of the best cheesemakers in the country and it was an absolute joy to finally meet him and try his cheese. So, happy with the weekend, I drove home to find David tending to a very poorly goat ... Bringing the girls in for evening milking, he had found Krhoda (one of the older Mary goats) looking very miserable out in the field. Head down, heart racing and barely able to stand .. He managed to get her inside where she collapsed on to a clean bed of straw. Things did not look good and so I called the emergency vet out to her. Prognosis was grim. Gemma thought that she had probably had a sudden severe stroke - after all, she had been absolutely fine all day. If she had been feeling poorly, she would have been in the barn and not out in the field. Vital signs were not good and so we took the difficult decision to say goodbye to Krhoda. Beautiful big white girlie, she was just over 7 years old and had been with us for almost 3 years since our friend Mary retired. She was a lovely girl and a great milker .. she will be sorely missed by us and all her goatie friends. Krhoda is the goatie right in the centre of this pic.